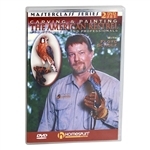 This up-close instructional video by world champion carver Floyd Scholz shows you how to transform a block of tupelo wood into a lifelike sculpture of a male American kestrel. Points out the unique physical traits of a live kestrel before delving into full instruction. Uses a wide variety of close-ups and camera angles to cover the whole process clearly from beginning to end. Reveals award-winning methods and insider tricks for carving, texturing and painting. Two-DVD set, 270 minutes.